The six foot lighted tree is decorated with a gorgeous underneath rich majestic garment , with eye catching faux fur with accompanying Christmas Reef with Beautiful Birds and Pine cones will Catch the eye of all can be passed Down For Many Generations Great In Front of Fireplace or Entry Way! 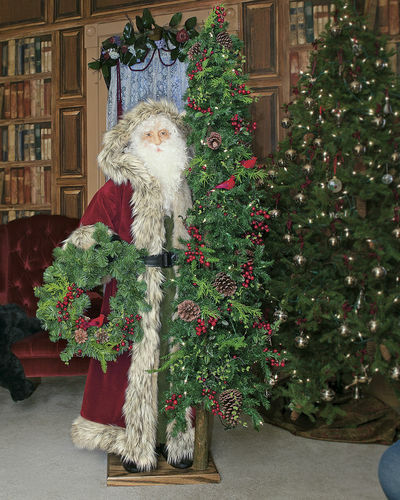 Father Christmas stands 57” Tall on a 12” x 18” beautifully wood stained base. 3000 hours of lights.